Portugal only has one participant in the 2010 Winter Games. That man is Danny Silva. They also only have one sausage participant in my fridge. That sausage is: Linguica. Along with some garlic, onion, peppers, eggplant, mozzarella, sauce, and multigrain dough this made for a fantastic pizza. 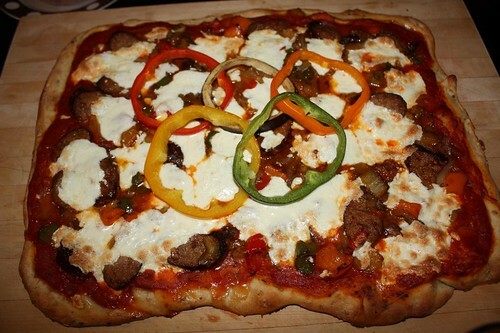 I used multicolored peppers (and a ring of eggplant) to decorate the pizza in a fashion that would bring Danny Silva an enormous amount of pride for his country. I imagine that he would eat this pizza whilst cross-country skiing across British Columbia. The Linguica would serve a dual purpose of keeping him warm and reminding him of his homeland. 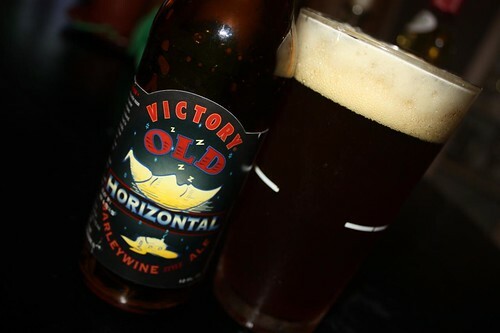 For beer I had a Victory Old Horizontal Barleywine Style Ale from The Brewmasters of Victory in Downington, PA. The beer was good but I wish I'd realized a little sooner through the bottle that it was 11% alcohol. I thought it was a little on the strong side but it was only after seeing that that I realized why it was called "Horizontal." The label even features the moon wearing a sleeping cap and sleeping. I have significantly less mass than the Earth's satellite and I'm surprised that I'm still vertical after consuming this with dinner. I imagine this beer would be a good substitute for brandy should any St. Bernards find Danny Silva in a snowbank somewhere. My only fear would be that they may further incapacitate him. Brandy may be a milder option.